This gathering of policy makers and other stakeholders from Europe provides for an opportunity to discuss on how to advance the efforts in social and economic inclusion of the Roma people. 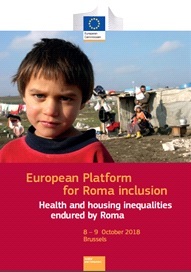 The thematic focus of this 12th Platform meeting was on inequalities endured by Roma in the areas of health and housing, two out of four crucial areas of the EU Framework for National Roma Integration Strategies up to 2020. All Member States have committed to this framework which was established in 2011 with a view to closing the gaps between marginalised Roma communities and the general population. Two parallel workshops devoted to Roma inequalities in the areas of health and housing took place on 9th October, in the morning. For that purpose, the EU umbrella Roma and pro Roma NGOs had prepared a background document. The workshop on health came up with recommendations on developing and reinforcing measures effectively targeting Antigypsyism and discrimination against Roma. The participants emphasize that responsible EU and member state authorities should invest in affirmative action programs for Roma to enter medical professions (i.e. scholarships and awareness raising among Roma youth). It is also important that Roma inclusion strategies in general and Roma health policies in particular are mainstreamed into the general policy process. In this respect, member states should use the opportunity when developing general health care reforms, to include provisions explicitly but not exclusively targeting the needs of Roma. Finally, workshop participants point out that EU and member states should use human rights approaches when developing health policies, and Roma health policies in particular. In this respect, the participants ask the EC to consider earmarking funding for EU-wide advocacy coalitions and strategic/impact litigation that aims at identifying structural deficiencies and discrimination potential of member states’ legislation, when it comes to Roma. The conclusion on housing was that, there is a need for more investments and a consensus related to the question of the use of funding, including the EU funds. Some of the main directions of the discussions followed the paths of meaningful Roma participation at all levels of decision-making, targeted, but also comprehensive approach, integrated approach, as well as contextual approach that could define what participants call ‘avoiding one-size-fits-all understanding of ‘the issue’’. These were some of the most important principles that must be respected in order to avoid unsuccessful projects and limited policy frameworks. Finally, there were many other challenges mentioned and argumentations developed by the participants, such as irregular settlements (non-legalized); living at constant risk of evictions; reduced education and employment opportunities; school segregation as closely related to residential segregation; rejection of access to school; being exposed to environmental hazards; lack of coordination among the policy actors; urbanization plan not responding the needs of people; a strong appeal for mobilization of civil society to advocate towards authorities to apply existing legislation; recognizing housing as a fundamental rights issue in the post 2020 policies etc. The workshops were followed by a plenary session of two exchange dialogues with various stakeholders, representing EU institutions, Member State's governments, Roma NGOs, academia, etc. The 2018 Platform, indeed, provided a useful forum for the exchange of views on reducing inequalities in health and housing Roma people are confronted with. As discussed within the workshops, only limited progress has been made in both areas. This was one of the reasons why both areas were brought to the EU level, for all stakeholders involved not only discussing the challenges but also identifying possible solutions. As discussed, Roma meaningful participation in all stages of the process, including decision making, efficient use of available funding, political will at all levels, national, regional, local are indispensable for the interventions to bring tangible and long lasting results. The Commission will carefully examine all the messages and recommendations presented by the participants within the workshops and the plenary session and will address them, within the remit of its competence, also in relation with the reflections on the future EU Roma inclusion strategy beyond 2020.